There's a movement by Republicans in Congress to revise the 14th Amendment so that it'll now deny citizenship to babies born to illegal immigrants in the US. 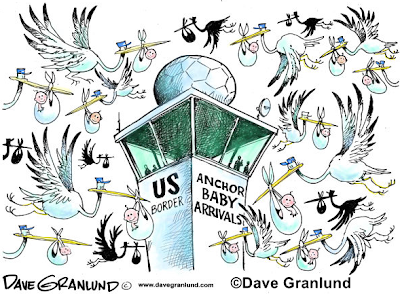 The so-called anchor babies whose arrival grants the parents immunity from any meaningful threat of deportation. How are you suppose to haul away the parents or even detain them from that point on? Dunno. It's just that there's been a bumper crop of anchor babies in recent years. Then came the recession. Legislation to plug the 14th Amendment loophole has been around for a while but it just seems to fizzle out whenever it has been put up for a vote. The US is about the only nation in the world that allows citizenship by virtue of birthright, albeit not by the letter of the law, but by a convenient misinterpretation of the statute. The 14th does not grant citizenship to a person "born on American soil." Or even to babies born "to parents with their feet firmly planted on American soil." The 14th states "born to parents within the jurisdiction of the US." "Jurisdiction," in this sense, does not refer to the physical borders of the US. Between the East Coast and the West Coast, between Makapuu Pt. and Haleiwa, etc. "Jurisdiction," instead addresses the legal standings of the parents of the baby at the time of conception. Thus, if the parents were illegal, the parents fall outside the same jurisdiction by virtue of their illegal status. The 14th Amendment excludes the children of diplomats and foreign ambassadors who were born in the US the right of citizenship despite the obvious that the dignitaries reside in the US legally. It goes without saying how the same exception applies to the children of illegal immigrants. The storks are probably driving the babies over en masse using the foot bridges they found in Texas that they can't or won't tear down. Brad- try wait. I never start fleshing in the details to my illustrious article yet. Now this was a very informative, interesting post. I'm glad you posted this, just because I don't understand very much of this situation. Kay- most people never heard of the 14th Amendment and if they did, the post would amount to a boring rehash. That's mainly my reason behind the topic, not so much how I might feel about the topic. The 14th Amendment was written after the Civil War during the Reconstruction Period. It's purpose was to ensure that babies born to slaves were not denied citizenship because the parents obviously couldn't produce birth certificates, with very few caveats written in the statute. That's where the misinterpretation or myth, "born on American soil," took hold, and basically that was the only requirement for birthright. The prospects of illegal immigrants gaming the system wasn't even on the radar back then since there were no gov't assistance to game. It would be like codifying household wiring and voltage before electricity was invented so to speak. Anchor babies do impact the classroom size among other symptoms of the same problem.